Please note this chapter is applicable only for theh3G device versions, equipped with a wireless modem. Connecting your device via a mobile network virtually allows for an access from anywhere in the world. 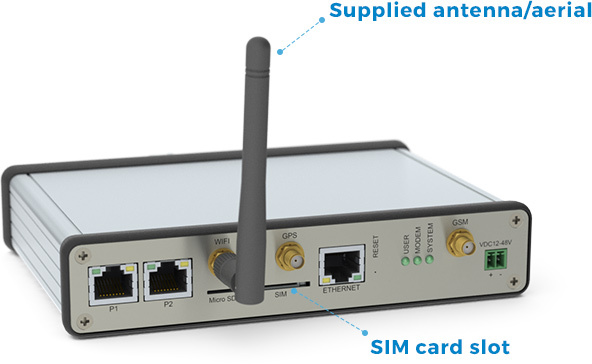 This can be done on condition that firstly, the device is installed in an area with a mobile network access. Secondly, the device has contains a SIM card with an active mobile data plan (contact your local mobile network provider for more information). The SIM card can be inserted into the front slot. It is recommended that you use the supplied aerial/antenna, however thank to the standard SMA connector you may use any other GSM antenna available on the market. As soon as the device is powered on, the internal wireless modem starts to automatically login into a preset APN (Access Point Name). Therefore, the correct APN must be set for proper operation – this can be also done through the web user interface, which is described later in this manual. By default the APN is set as “internet”.